This essay will briefly discuss the symbolism, hieroglyphic placements, and various aspects of a Mayan deity called Bolon Yokte. His presence on Creation monuments has special relevance considering that he appears in the text of a unique monument that points directly to 13.0.0.0.0, December 21, 2012. I'll also suggest a possible early iconographic form of Bolon Yokte that appears on the murals of San Bartolo. "Sky and earth are paired in the opening of the secondary text on the Vase of the Seven Gods for the 4 Ahau 8 Cumku event presided over by God L in which Bolon Yokte plays a role." "As more Classic-period occurrences of the name Bolon Yokte are found, we will better understand his symbolic referents and relationships. For example, the name appears on Tortuguero Monument 6 in the context of a future event, the end of the current Great Cycle that began on 4 Ahau 8 Cumku" (Gillespie and Joyce, 1998:291 n. 16). "One of the gods at La Mar, Bolon yokte K'u, plays a role in many texts, but the most enigmatic completes the inscription of Monument 6 from tortuguero, Mexico. Here is recorded a calendrical event in the early 21st century AD, at which time, apparently, the god may 'descend' ye-ma, y-emal (there are some technical problems with this translation). The reference is notable for its uniqueness. 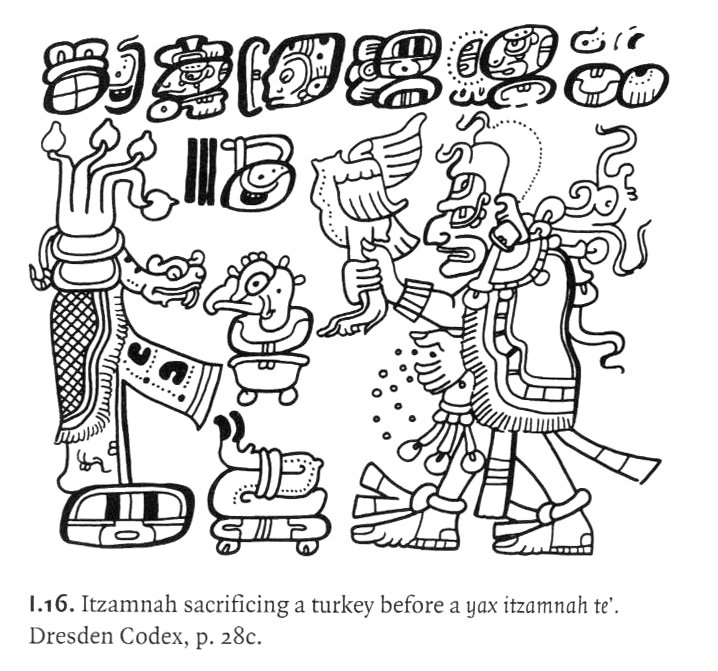 Prophecy forms an important body of colonial literature but is poorly represented in classic Maya texts, where future statements relate almost exclusively to impersonal events that are safely predictable (e.g., the 13 baktuns will be finished at 13.0.0.0.0 in the Maya Long Count)." So, specific prophecy with content for future events are rare in hieroglyphic texts. This may explain why there is a dearth of hieroglyphic texts on 2012one of the main complaints about my theory. For whatever reason, our expectation that there should be such texts is thus pegged as an erroneous assumption; such a dearth is the norm. This may reveal a Mayan conceptualization of past and future as non-local realities that collapse always in the present moment. We see this in the shifting tense usages when Maya folktales are told. It was, it will be, it isthese temporal locations are interchangeable in mythic time, the space of "everything manifests in the now." Notice the footprints on the apron coming out from beneath the cape on the deified crocodile-tree (the Milky Way). Gillespie and Joyce (in Ancient Mesoamerica, 1998) discuss this iconographic motif in relation to God L and Bolon Yokte. Bolon Yokte is usually deciphered to mean Bolon (nine) y- (plural) ok (foot) -te (tree). Thus, the "Nine Footed God" (according to Edmonson), or God of Nine Steps. My own reading of the deity's name allows for the homophony between bolon and balan, nine and jaguar, which has been noted elsewhere in Mayan imagery and word puns. Thus, Bolon Yokte = Jaguar Foot/Feet Tree. 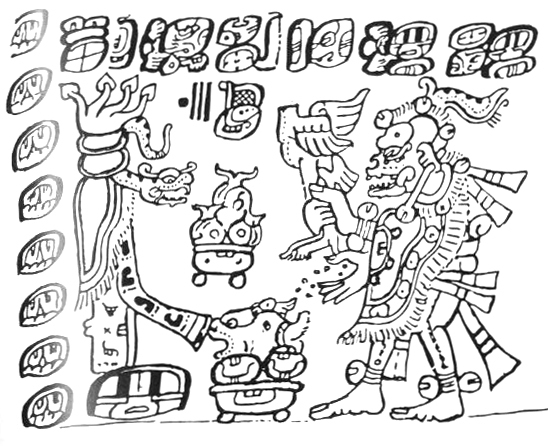 This image corresponds more closely with the mysterious jaguar foot that is seen at the foot of the cosmic tree in Creation imagery, especially on the early San Bartolo murals. The plural "feet" could refer to the two feet present in the pun: foot of the jaguar and foot of the tree. Could this be an early iconographic form of Bolon Yokte? It's just a hunch, but perhaps epigraphers more knowledgeable than I could comment. Those who have read Prophecy among the Maya in a previous FARMS publication are aware that native Mesoamericans at the time of the Spanish Conquest had prophets. Prophecy was a feature also of inscriptions on certain Maya monuments of the Classic era (approximately AD 300800), although almost all of the inscriptions exclusively refer to impersonal events that are safely predictable, such as future completions of a given calendrical period. Recently, however, a prophecy of a more specific event has been identified on a Maya monument that was erected around A.D. 670. It points to a definite future event. At the site now called Tortuguero, about 35 miles west-northwest of Palenque in southernmost Mexico, Monument 6 bears an enigmatic inscription. An event is mentioned that was expected to take place on the Maya date 13.0.0.0.0 4 Ahaw 3 Kankiin; following the generally accepted correlation of their calendar with ours, that would fall on Sunday, 23 December 2012. (Some modern interpreters have spoken of this date as the end of the world, although there is no explicit basis for that idea in Maya lore.) 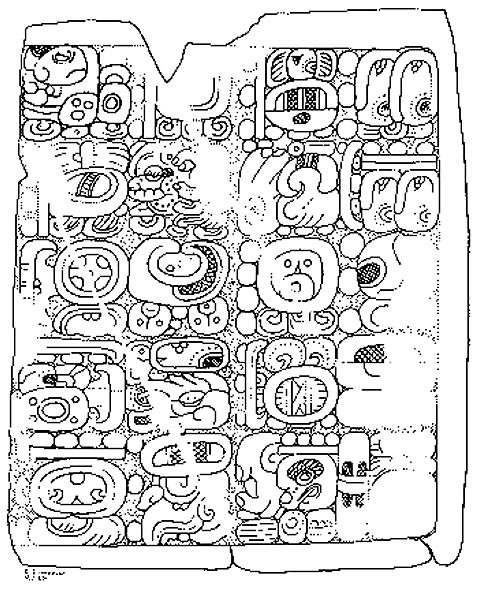 At that time the god Bolon Yokte Ku was prophesied to descend, presumably from a heavenly realm to earth (erosion damage of a key glyph makes the reading of the verb somewhat uncertain). This monument allows us to be confident that the practice of prophesying future happenings was going on within a few centuries after the end of the Book of Mormon period, and since the custom of recording prophecies continued for at least a thousand years into Spanish colonial times, probably Monument 6 is not the earliest manifestation of the pattern that will be found. Such prophesying thus could have been going on from before Mormons day. 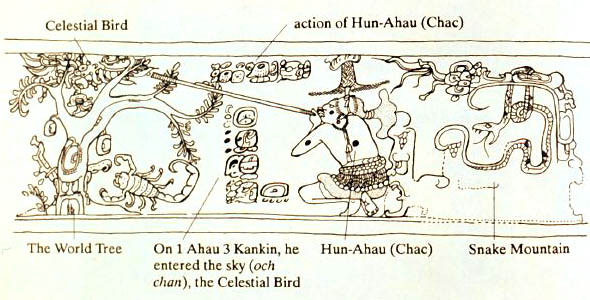 relationship to the Principal Bird Deity, as well as war associations. long-lasting character who's still around somewhere waiting, I suppose. *See the illustration at the top of page for full hieroglyphic text of Monument 6. One thing about Bolon Yokte's presence in the 2012 text should be emphasized. Apart from symbolizing war, conflict, and the underworld, Bolon Yokte is a god that is often present during Creation events, often referring to the Creation event of 13.0.0.0.0 in 3114 BC, and most notably on the Vase of the Seven Lords. So, what does it mean that a Creation Lord is present on the next 13.0.0.0.0, the one that falls in 2012 AD? Although some scholars have commented that the incomplete text on Tortuguero Monument 6 doesn't tell us much, they have overlooked the obvious: Bolon Yokte's mere presence suggests that 2012 was thought of as a Creation, a worldrenewal that, after all, makes perfect sense in the context of a World Age doctrine that sequences forward in intervals of 13 baktuns. This may seem to go without saying, but in fact my work has been criticized for characterizing 2012 as a "cosmogenesis." Here the scholars are one step closer to understanding 2012 for what the Maya knew it to a be: a rebirth and the beginning of a new World Age. Gillespie, Susan D. and Joyce, Rosemary A. 1998 "Deity Relationships in Mesoamerican Cosmology: The Case of the Maya God L." Ancient Mesoamerica 9:279-296. Houston, Stephen and Stuart, David. 1996 "Of Gods, Glyphs, and Kings: Divinity and Rulership Among the Classic Maya." Antiquity 70:289-312. Eberl, Markus and Prager, Christian. by Peter Eeckhout and Geneviève Le Fort, BAR International Series 1385. pp. 28-36. John Major Jenkins. Copyright. May 12, 2006.